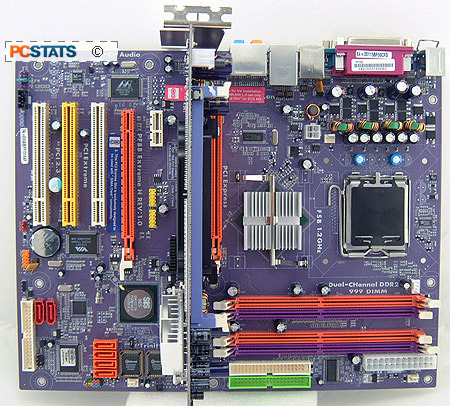 Abstract: The ECS PF88 Extreme Hybrid motherboard, in the configuration pictured, works with either a socket 775 Intel Pentium 4 or socket 939 AMD Athlon 64 processor. Software flexibility is probably the computer's greatest asset. A given computer can be just a workstation PC in one person's hands, yet be a lightning fast gaming rig to another. If you don't like Windows or a particular software program then scrap them and try one of the many alternative operating systems or competing applications on the market. It's your choice. While flexibility is the name of the game in the software world, the computer hardware realm is a lot stricter. Considering most users only upgrade or buy a new desktop system every few years, the mainstream PC processor choices are either AMD or Intel - where mainstream non-MAC users are concerned anyway. And once you've made that choice you've got to stick it out for the long run, even if the opposition has better technology a little later on. It's even worse for enthusiasts who upgrade consistently, since moving platforms can incur huge costs in new memory, videocards and supporting hardware. What would you say if PCSTATS told you that we have a motherboard here which combines the best of both Intel and AMD CPUs through an innovative daughtercard system, all one board? The ECS PF88 Extreme Hybrid motherboard is on our test bench for a thorough examination, and in the configuration pictured it works with either a socket 775 Intel Pentium 4 or socket 939 AMD Athlon 64 processor. Intrigued yet? Natively, the ECS PF88 Extreme Hybrid motherboard uses the SIS 656 Northbridge chipset which supports Socket 775 Pentium 4 processors in 1066/800/533 MHz FSB flavours (SiS only says the 656 supports up to 800 MHz), as well as up to 4GB of DDR2 memory. Despite the two PCI Express x16 slots on the PCB, the SiS 656 only supports one videocard. The second PCI Express x16 slot is for... other platforms (more on this later). The weird PCI Express looking slot between the two PCI Express x16 slots is where the magic happens thanks to SiS. In what ECS calls the 'Elite BUS slot', we can insert a 'SIMA daughtercard' which enables the board to use other platforms using compatible SiS chipsets (such as Athlon64, Socket 478 P4 or Socket 479 Pentium M) with the resources of the main motherboard. Neat. The SiS 965 Southbridge supports four Ultra/133 IDE HDDs as well as four Serial ATA I HDDs which can run in RAID modes 0, 1 and 0+1. Other hardware goodies include IEEE 1394a, an additional Silicon Image Serial ATA II RAID controller, Gigabit LAN, a USB 802.11g Wireless NIC and 7.1 channel audio. All these I/O resources are available regardless of which processor, or northbridge chipset, the PC happens to be using. Pg 19. Versatility is the key to the ECS PF88 Extreme!